Walking up a staircase in San Francisco, Rich Rider recalls a letter he has sent to his girlfriend, Laura Dunham. In his letter, Rich explains how he gained his powers from Rhomann Dey and used them to fight super-villains as Nova. He also tells her how he helped defend Xandar in the Skrull/Xandar War. Rich's letter continues to explain how Night Thrasher revived his dormant powers (by throwing him off of a building) in exchange for Nova's membership in the New Warriors. Laura learns about the recent events which resulted in the loss of his powers. Adora has stripped Rich of his powers and given them to his replacement, Garthan Saal. Powerless and angry, Rich and Saal (Nova Omega) argue about his situation. Nova Omega tosses Rich aside and tells him to change into civilian clothes for his return to Earth. An hour later, a Xandarian Battle Cruiser with Nova Omega, Rider, Reban and Kanan is bound for Earth. As Saal places surveillance spheres in Mars' orbit, Rich questions Reban on the sphere's purpose. The Xandarian pilot tells him they are tools to assist Nova Omega in duties. Rider doesn't believe him but is interrupted by Kanan. The co-pilot has done a class one scan of the ship and has found an anomaly in ship's cabin. As Rich and Kanan attempt to pinpoint the anomaly, Reban presses a button and fires the ship's engines! Kanan demands to know why Reban fired the engines and discovers he isn't his old friend! Reban's body morphs into its true form of the Dire Wraith Queen! Kanan and the Queen exchange gunfire and the Xandarian pilot is disintegrated! As the battle cruiser enters Earth's atmosphere, Nova Omega notices a hull breach caused by the energy blasts. The Queen and Saal attempt to save the ship and are barely able to land in California. From the wreckage, Rich finds an energy weapon and searches for the Queen. The Dire Wraith appears from the ground and prepares to attack Rich! Suddenly, Nova Omega arrives and the two prepare to fight the Queen. Rich fires his weapon but she dodges the blast but merging with the ground. The energy misfire hits Saal who takes Rich's gun and destroys it. Nova Omega tells Rich that the Earth is in danger from the Queen and the two begin a heated argument. Rich tells Saal that he is going to get his powers back and show him how to do the job right. 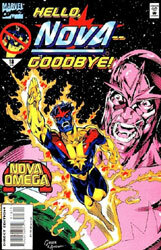 Nova Omega answers by saying that Rich needs to accept his current situation because he'll never get the Nova Force again. After Saal leaves to find the Dire Wraith Queen, Rich begins walking to San Francisco. The letter to Laura ends with Rich explaining his plan to regain his lost powers. Hoping that his powers are only dormant like before, Rich plans on jumping from a skyscraper to reactivate the Nova Force. He tells her that if he succeeds, she'll never see the letter. If he fails, Rich wanted her to know why it happened. Rich jumps. Continued in New Warriors #60!